Dr K. P. Buteyko’s method has reached over 15,000 asthmatics with a claimed success rate of more than 90%. These results were subsequently validated. Buteyko featured positively in scores of newspaper articles, current affair television programs and radio interviews. The trials (one “open” in Melbourne and one “randomised controlled” in Brisbane) showed Buteyko’s method to provide unprecedented positive results for asthmatics. Australian Doctor (7 April 1995), a medical journal, carried on its front page “DOCTORS GASP AT BUTEYKO SUCCESS” and went on to report “Buteyko breathing hyperventilation exercises in patients with asthma reduced beta agonist use by 90% and improved symptoms, according to preliminary results of a randomised, controlled trial in Brisbane”. The Medical Journal of Australia (Volume 162) reported “the open trial of the Buteyko method clearly showed unprecedented broad spectrum improvement in the short-term and medium-term, a dynamic breakthrough”. One of Australia’s foremost asthma authorities, Professor Charles Mitchell of the University of Queensland, was reported as saying after the initial controlled trials: “They feel much better and use fewer bronchodilators – this is terrific!”. Initially doctors were sceptical but in time, scores supported Buteyko’s method. “As a medical doctor and naturopath I am impressed and surprised at the effectiveness of this natural approach”. Dr. Paul Ameisen MBBS, MD, Dac, ND; Sydney. “I have experienced the Buteyko breathing technique both personally and professionally and found it to be a very effective treatment for asthma and I’m certain you will be impressed. Give the treatment a trial”. Dr. Kevin Treacy. MBBS; The Gold Coast. 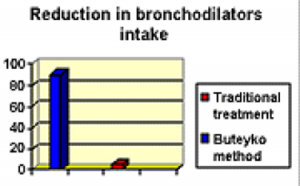 Gisborne Hospital Trial 2000: a six month trial undertaken at the Gisborne Hospital New Zealand found Buteyko participants reduced their use of reliever medication by 85% and inhaled steroids by 50%. Official approval from the Ministry of Health. Buteyko’s method proved so successful that it received a special order from the Ministry of Health (Number 591 on 30 April 1985 by SI Burenkov, Minister for Health). The Chair of the Childhood Diseases Centre at the First Moscow Institute, after rigorous clinical approbation, concluded that “Buteyko’s method proved to be very efficient in the complex treatment of bronchial asthma and helps to decrease the number and severity of attacks, at the same time reducing medication or completely revoking the need to take the mediation”. Further tests were duly carried out. Approximately 100,000 patients with asthma (being treated with drugs) have completed the course over 6 years. Of the original 100,000 approximately 92,000 do not take medication at all today. Click here to view the results of the Approbation of the ‘BBL’ Method in the Department of Children’s Diseases in the first Moscow Medical Institute of E. M. Sechenov.